In an interview on Monday, first daughter Ivanka Trump said even though she keeps an office in the White House and hold an official position within her father’s administration, when it comes to politics the first daughter tries to stay out of her father’s way. “I try to stay out of politics, his political instincts are phenomenal. He did something that no one could have imagined he’d be able to accomplish,” she said when answering a question about her obsessive Twitter habit. “I feel blessed just to be part of the ride from day one and before. But he did something pretty remarkable. But I don’t profess to be a political savant, she added. 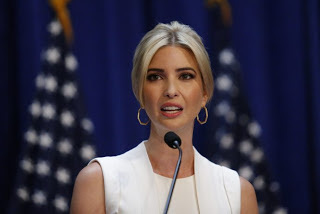 Ivanka Trump was a major part of her father’s presidential campaign,she also joined her father in Washington unlike her two adult brothers, who remained in Manhattan to take over the family business. She moved along with her husband Jared Kushner, who also took on a role as an adviser to President Trump. Trump’s official position in the White House as a special assistant is unpaid. She said she does not always agree with President Trump but that various points of views within the administration are beneficial to all. “So naturally, there are areas where there is disagreement. We’re two different human beings. I think it’s normal to not have 100 percent aligned viewpoints on every issue. I don’t think anyone operates like that with a parent, or within the context of an administration,” she said. “And I think that all different viewpoints being at the table is a positive thing. And I think one of the things that, in this country we don’t have enough of, is dialogue”, she added.